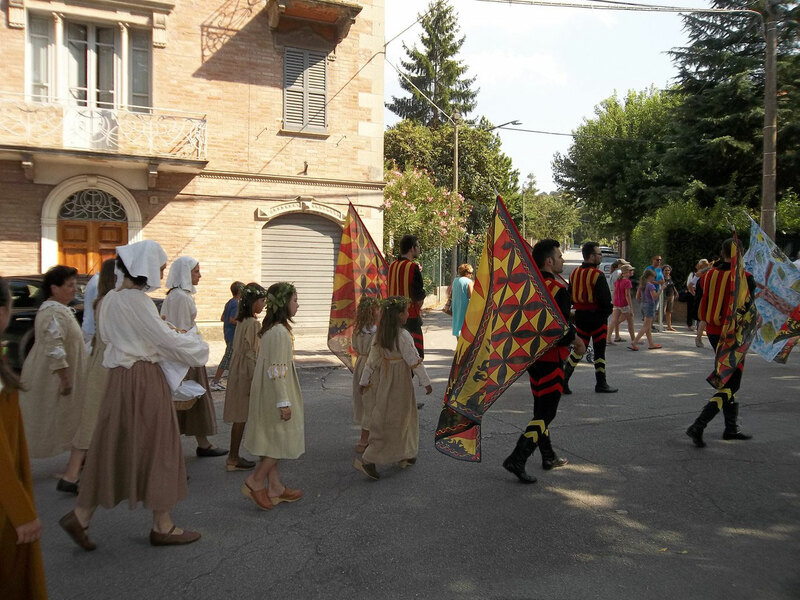 Sunday, I went with a friend to the last day of the Torneo Cavalleresco in Servigliano.It goes for nine days with different events each day - medieval music, dinners, games. Sunday's event was a little like Ascoli's Quintana but on a smaller scale. We watched the procession of the representatives of the five contradas, all dressed in medieval costume, as they walked, to the beating of the drums, from Castel Clementino to the sport field (part of a prisoner-of-war camp during WWII) where the Giostra dell'anello took place. As real jousting is out of the question (too much blood and gore and probably no volunteers! ), the five riders, one for each of the contradas, race against the clock on a figure of eight track carrying a lance which they use to take 3 rings from a tower on the middle of the track. Beautiful horses, wonderful horsemanship and incredible skill with the lance - an event worth seeing.